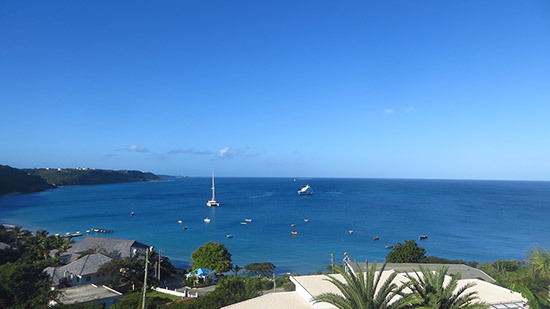 Nestled in the hills surrounding picture-perfect Crocus Bay lies CéBlue, a new, luxury boutique hotel. 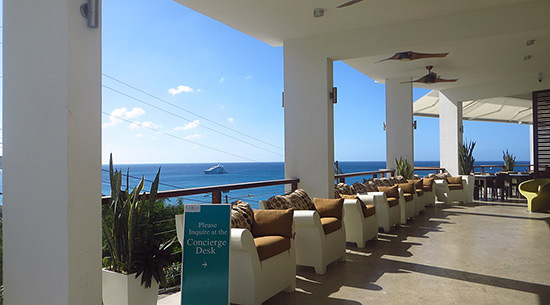 From the design, to the breathtaking views of the turquoise sea, to the service, to the concept, CéBlue is a unique addition to Anguilla's resorts and hotels. 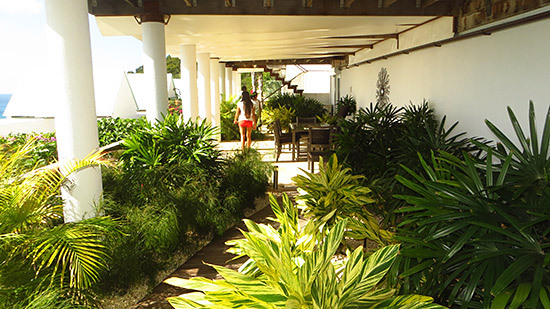 Made up of 8 private 5-bedroom standalone suites, CéBlue is ideal for those seeking the conveniences of a traditional resort, but more privacy than a hotel typically offers. 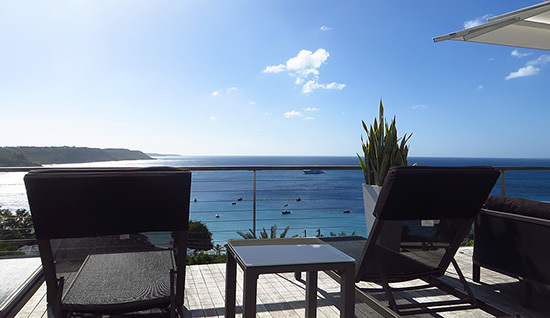 Perched high on Crocus Hill, CéBlue, a new luxury boutique resort, offers views that stretch for as far as the eye can see. Blue sky meets blue sea. With Sandy Island out in the distance, fishing boats bobbing in the foreground, a rum punch in hand, on a wooden deck, surrounded by loved ones, the scene is a setting from a movie. The entrance is towards the end of Crocus Hill. 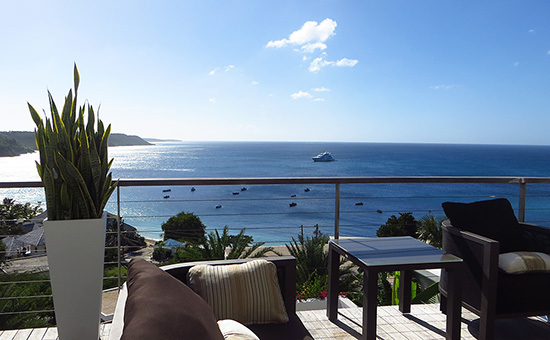 Even from this lower elevation, CéBlue's Club House's view sets a high bar. Surrounded by blue views, white walls and a cool marble floor, the feeling was fresh, open air yet intimate and serene. A smiling receptionist was ready for our arrival. She promptly introduced us to Delroy Lake, a.k.a. 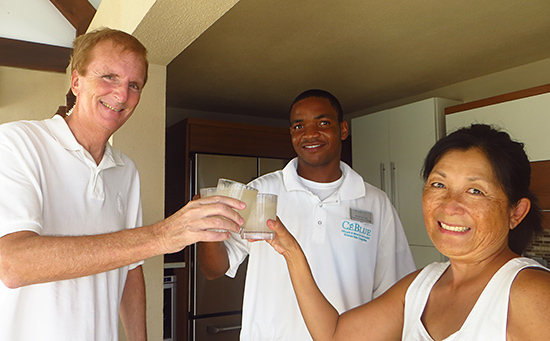 "DJ," who would acquaint us with the property, and would take care of us during our whole stay. DJ scooped up our bags and showed us to a golf cart. We were going to make the near vertical climb up to our villa. 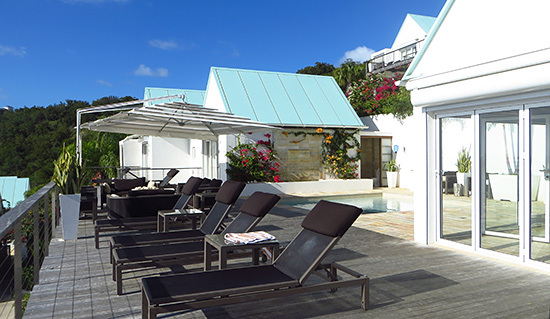 CéBlue is made up of eight 5-bedroom villas which stair-step up the side of Crocus Hill. 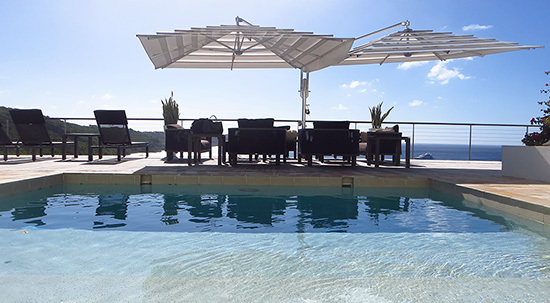 Tip: If you like high views and are seeking the most private experience, book the highest villa on the property. The entrance is a pergola-covered walkway lined with blooming bougainvilleas. It opens up to an expansive outdoor living space with the kitchen/dining room on your left. Each unit is made up of several individual, stand alone rooms that close off from each other. 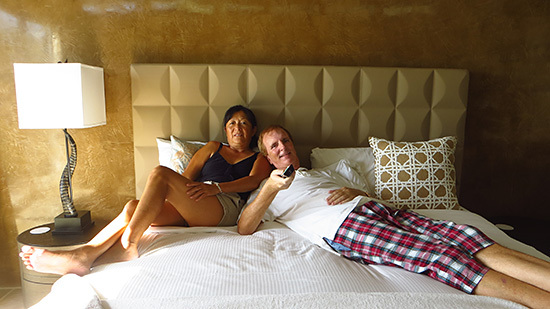 The accommodations are oversized, plush and comfortable, maximizing outdoor living space. As we were soon to see, indoors and outdoors merge almost interceptably. ... and a welcome drink (also served in chilled glasses!). After an arduous journey (a 15 minute drive from our home! ), these thoughtful touches eased all travel pains. Refreshed, we were ready for DJ's tour. "Buckle up. There's lots to see!" he said enthusiastically. 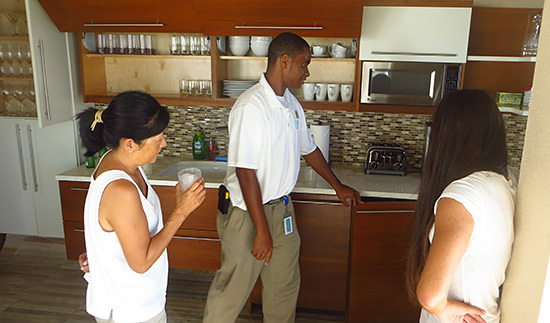 Already in the kitchen, sipping our welcome drinks, DJ started the tour there. Modern with brand-new appliances, it has everything you need should you want to prepare meals or hire a chef. Cups, cutlery, toaster, coffee maker, microwave, you name it, it's there. The dining area has a large, wooden table, with comfortable, white-upholstered chairs which are on rollers for easy movement. 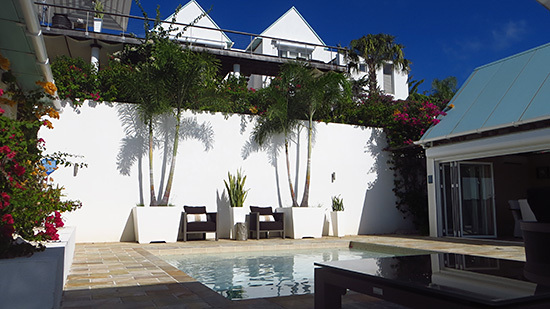 Design-wise, the feeling is markedly contemporary, still with Caribbean touches and a laid-back yet elegant beach vibe. 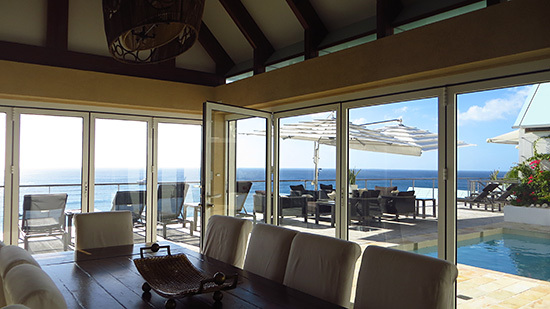 The floor-to-ceilings windows maximize the view out to sea. The windows are actually retractable doors. If you prefer dining al-fresco or want to make the transition from outdoor to indoor living more seamless, those doors pull back. Placing the kitchen adjacent to the lage outdoor living space was a stroke of genius on the designers' part. Need a drink? Craving a snack? 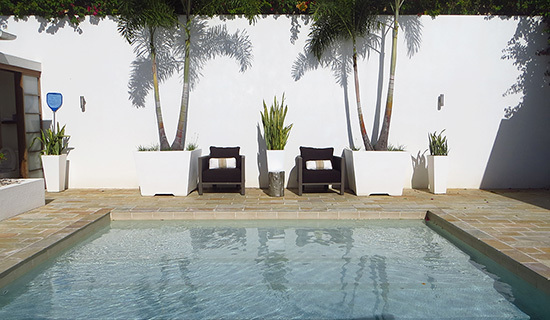 It's all just a few steps from the cool pool and relaxing lounge chaises. The outdoor living space is CéBlue's focal point. The design and layout couldn't be more soothing, with its textured, earth-toned tiles, pretty flowers snaking up the white walls, and desert potted plants placed throughout. 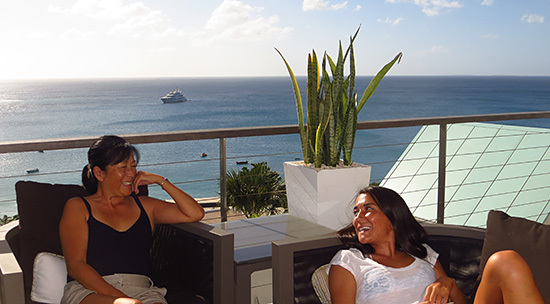 Fine-line design has been flawlessly blended with Anguillian influence. 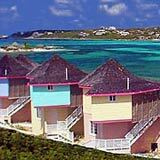 For instance, take note of the style of the turquoise roofs. That type of architecture is historically Anguillian. Back in the day, many houses had exactly that type of peaked roof. 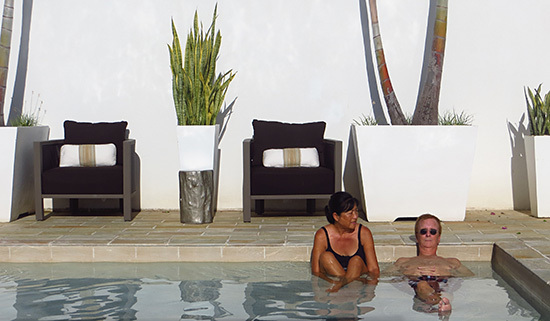 CéBlue has modernized Anguillian architecture and design, lending a contemporary-fresh feel, without casting aside the character and charm of its surroundings. Beyond the pool, tile turns to wood and the deck area expands, long and wide. The varied use of materials lends warmth to the patio. 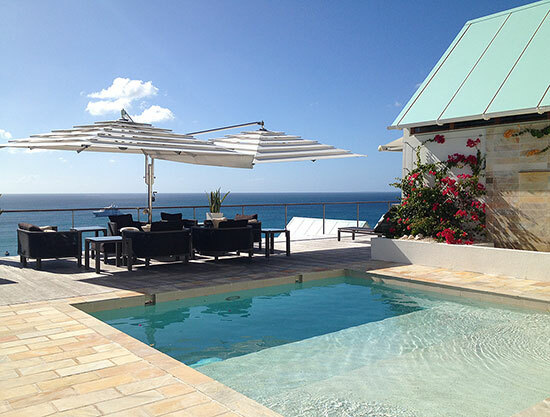 On the outer veranda, there's plenty of seating and shade under the stylish, white umbrella. Two bedrooms are located to the right of the pool, one bedroom is to the left (past the kitchen/dining room), and there are two additional bedrooms on the villa's lower level. The layout was planned with families in mind. 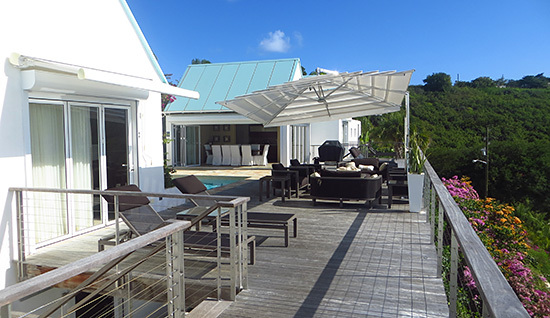 The 3 bedrooms on the top level are meant to be for adults as they are close to the pool. 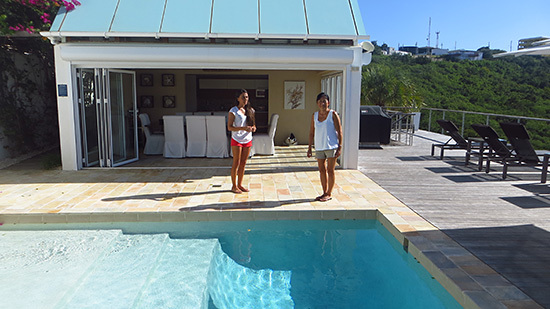 Downstairs is the kids-zone, away from the pool, with no risk of them wandering onto the deck at night and falling in. The bedrooms are all similar. Tip: I would recommend taking either first-floor bedroom located on the "ends." There is one bedroom on each far end of the deck, and one in the middle. The ones on the ends have larger bedrooms, sink bathtubs and more privacy. All have a private bathroom, a flat screen TV (with Blu-Ray), iPod docking stations (with USB ports! ), air conditioning, a desk and plenty of storage space. Decor-wise, the feeling is "zen," with pretty orchids adorning the desks and bathroom counters. 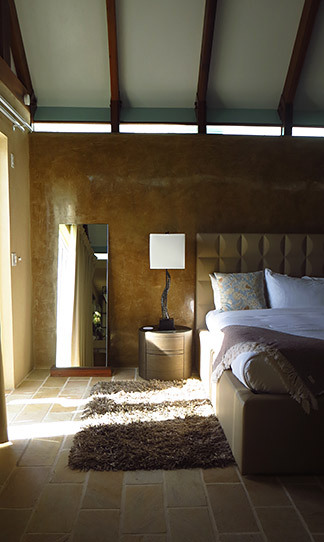 The rooms also have classic Caribbean-style vaulted ceilings. 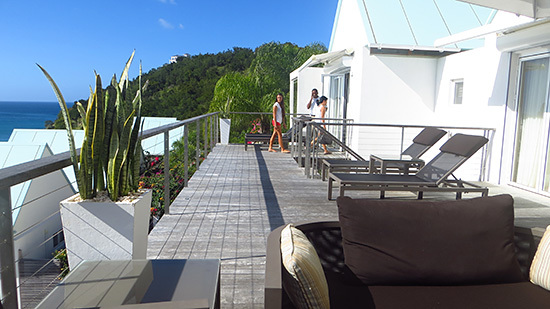 That blend of Caribbean-warmth and modern-fresh aesthetic is employed throughout. All bedrooms also have floor-to-ceiling windows that look out over the sea. 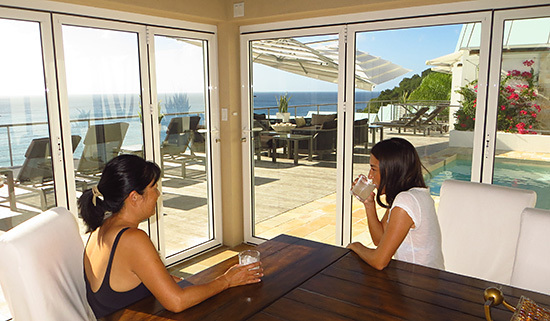 In the same fashion as the kitchen and dining room, these windows can all be retracted, just in case you want the full ocean breeze blowing through, cooling you in the evening. 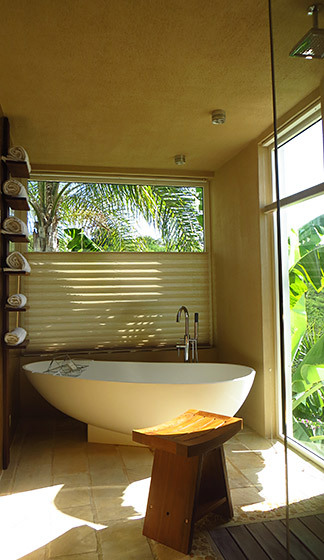 Each bathroom has a luxurious rain shower. 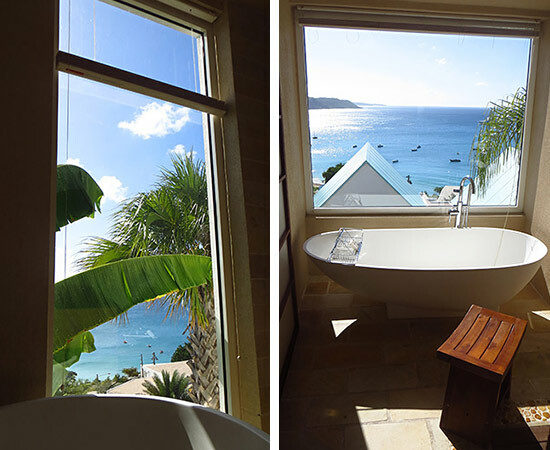 The rain shower, like everything else at CéBlue, has been so elegantly designed. The water gently falls on a beautiful hard wood drain. And, there's a wood stool for placing all toiletries, too. 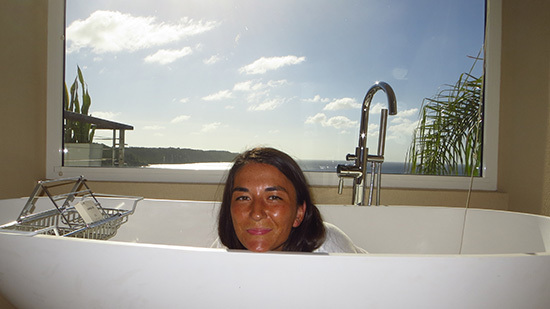 In addition to the shower, two of the bedrooms on the upper floor have large, sumptuous sink tubs. 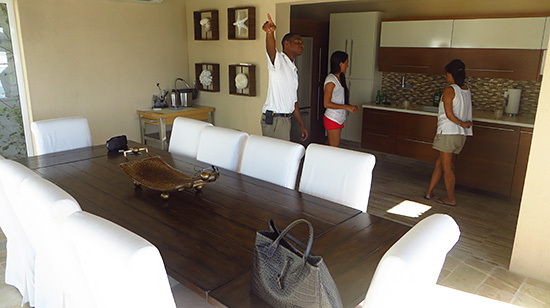 After touring the three bedrooms on the top floor, DJ showed us the way down the steps to more bedrooms, the garden space and entertainment room. We took a second to catch our breath and gaze longingly out to sea. DJ reminded us that the tour was far from over. I guess he could see enchantment setting in, a glazed-look overruling our eyes. "Let's continue," he laughed, eager to show us the rest of the property. The first bedroom on the lower level is nearly identical to the ones upstairs. The second one is quite unique. 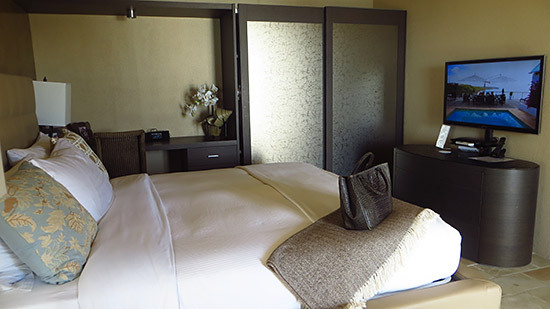 It is perfect for families and those traveling with nannies. It is a "nanny bedroom." 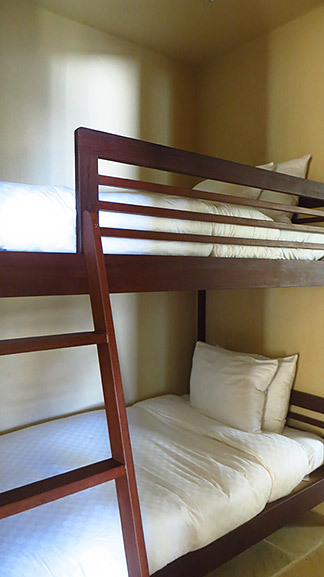 The bedroom itself is larger and has an adjoining bunk bed area. The nanny, or Mom and Dad, is always right there, never out of reach with the children. Children will always be safely entertained in this bedroom. Thinking back to when we were kids, my sister would have loved this space. 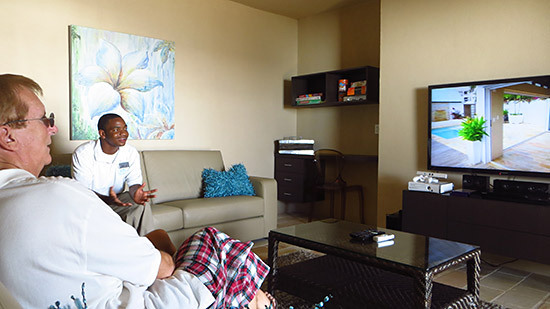 The room is air conditioned, with a 55" TV, all of the gaming a kid could ever want, and board games too. As a kid, she wasn't one for the beach and snorkeling. She was "that kid," on the beach playing her GameBoy, dreaming of being inside on her Playstation. Without a doubt, she would have spent all of her time here. For those traveling without kids, this room makes a terrific setting for movie watching or for watching sporting events. "That's almost a wrap," DJ said with a smile. "What do you mean almost? There's more?!" we replied in a little bit of disbelief. 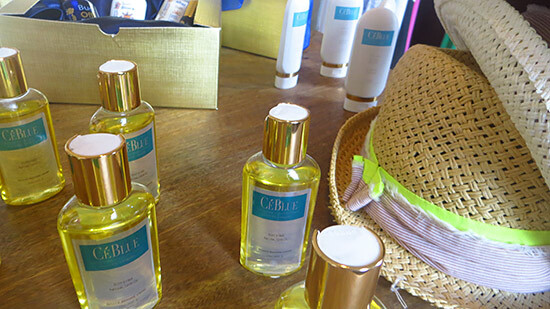 "Well, there's also that which makes CéBlue a true resort," he explained. "First, there's around the clock service. Call down to front desk anytime you need anything, day or night. And, there are many amenities located at front desk, too," he went on. "We bought flatscreens and installed them," DJ started, "but nobody was using them. Everyone was so taken with the view!" 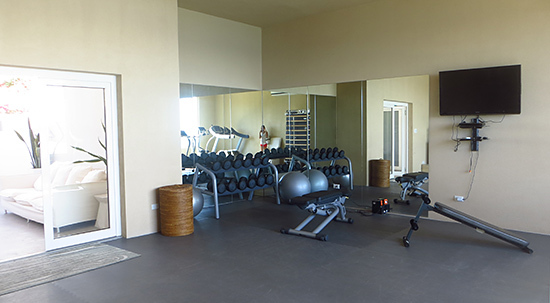 In addition to the cardio machines, they have a wide variety of weights. 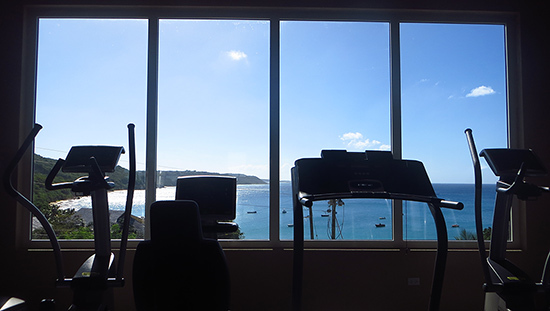 You can hire a private trainer, and the resort also features "Joe's Boot Camp," a morning workout held daily with their resident trainer. 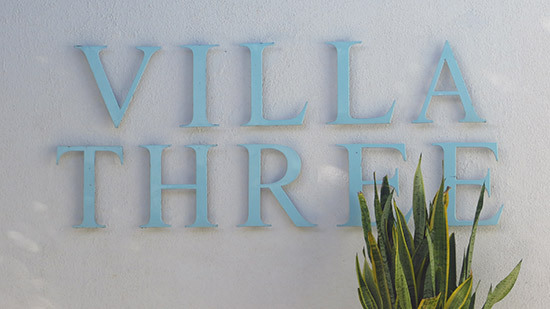 Just nextdoor to the gym is the resort's spa and their boutique. 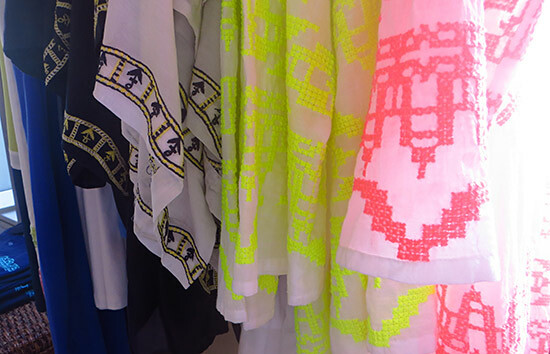 Looking for stylish beach-wear that suits Anguilla's warm, dry climate? 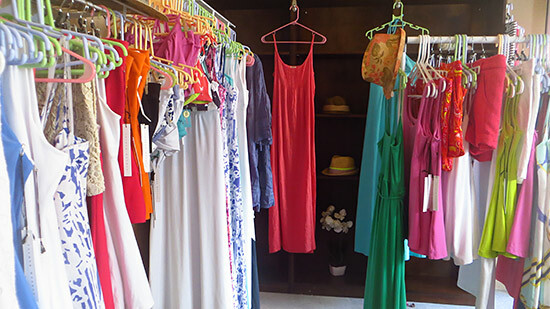 CéBlue's boutique has you covered if you're seeking something colorful, breezy and tropical, yet still in keeping with trends world-wide. Lastly, what's there to DO at CéBlue? 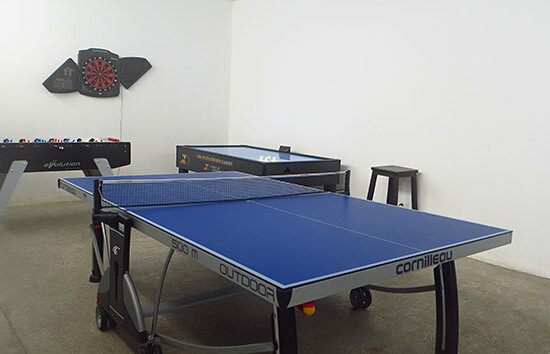 For the kids, there's ping pong tables, air hockey tables, foos ball, and darts. 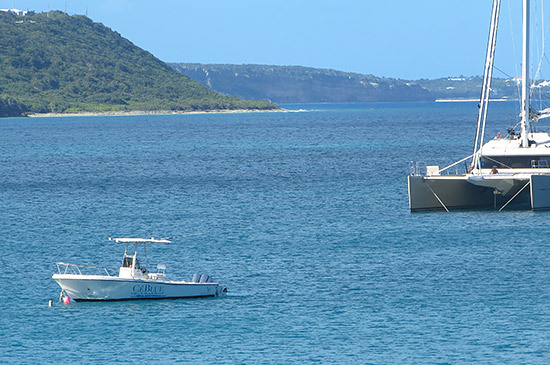 CéBlue also has their own boat (on the left, photo below) and holds a number of activities daily, including tubing, water skiing and wakeboarding. Non-watersport activities offered daily vary and can include activities such as a hike out to Iguana Cave. 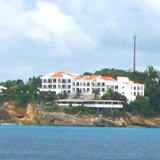 Lastly, the resort offers direct access to Crocus Bay and top-rated restaurant da'Vida via golf cart. Down on the beach, you can dine at da'Vida, use their kayaks and snorkeling gear, take a stand up paddle board out to Little Bay, and sign for it all, too! More details on CéBlue's amenities. Before parting ways with DJ, we asked him if we could order a bottle of Pinot Grigio to the room. "Right away," he replied. There was just one thing left to do now... change into our swim suits, be warmed by the afternoon sun and do nothing at all. When you work all day, everyday, nothing beats the absolute bliss of putting your brain on pause. Welcome drinks finished, wine in hand, step 2? The pool was perfect for my Mom who can't swim. Shallow and only 5' at its deepest, it's ideal for wading and lounging. In fact, my Dad didn't move all afternoon. He just worked on his "treading water." Click the video below to see. Hit replay to get an idea of the whole afternoon. 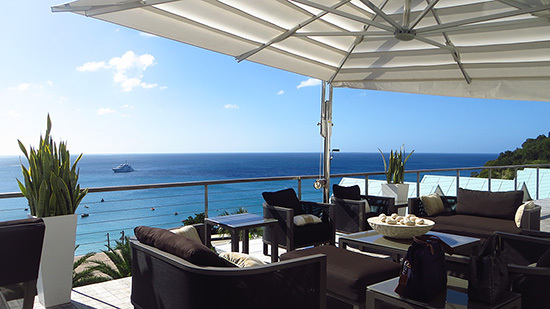 Facing west, CéBlue's suites offer a maximum amount of sun exposure. The late afternoon sun is particularly strong and warming. Utterly relaxed, my Mom played Candy Crush and I chatted with my sister via Skype (WiFi is property-wide, even outside). 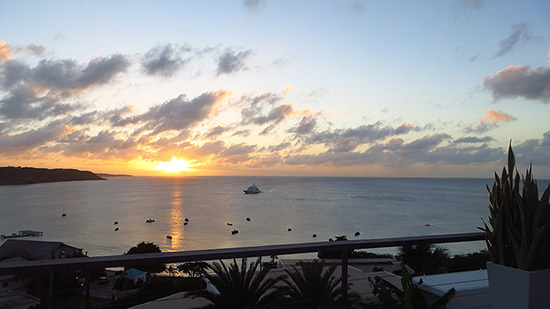 Crocus Bay is quite possibly the best arena for sitting spectator to the setting sun. With a full view of the sea and sky, and facing west, sunsets here seem to last forever, every last ray sparkling across the vast sea. 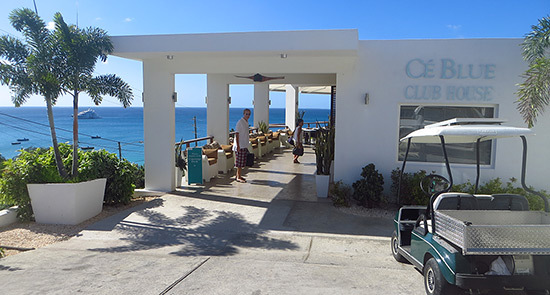 Sun down and appetites whetted, we called down to front desk for a pick up (via golf cart) to the CéBlue Club House to dine at the on-site restaurant, Blue Bar. Modern and trendy, the light night sky overhead, the glistening bay at our finger tips, the setting is idyllic. CéBlue features their own restaurant, Blue Bar, which serves a variety of pizzas and Italian specials. 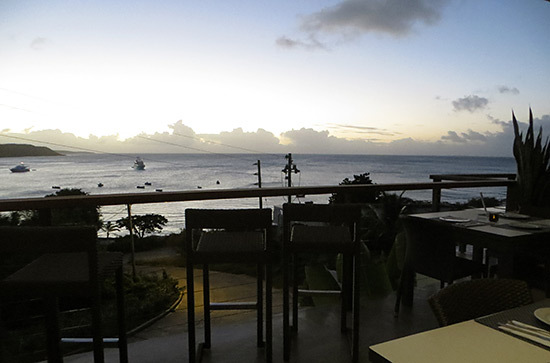 If you're in the mood for Caribbean-style cuisine or Caribbean-Asian tapas, da'Vida restaurant is just 30 seconds away. 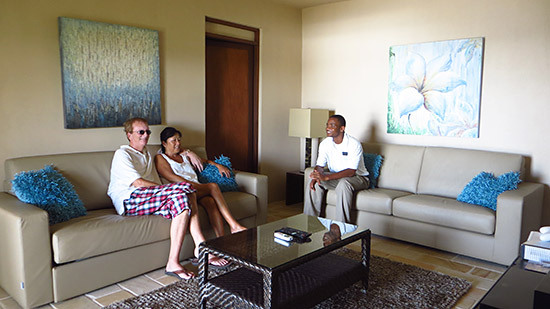 All CéBlue guests have signing privileges at da'Vida. 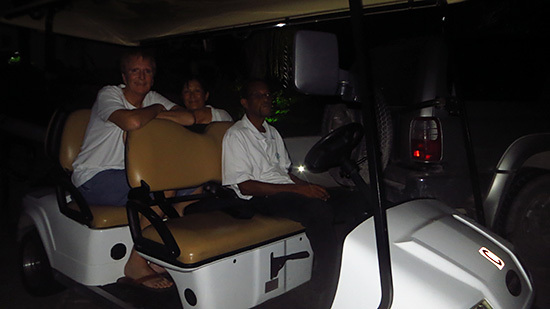 Simply call down to the front desk and they will pick you up via golf cart and bring you back at the night's end. Visit CéBlue's official site for more on all of their dining experiences. The menu? Perfectly cooked pizzas and other Italian dishes. From the savory pizzas, to the catch-of-the-day, to the signature dessert (possibly the best dessert on the island! ), all topped with a bottle of wine, the evening was indulgent to say the least. You can read more on Blue Bar here. At the meal's end, our waitress called us a golf cart to take us back up to our hotel suite. 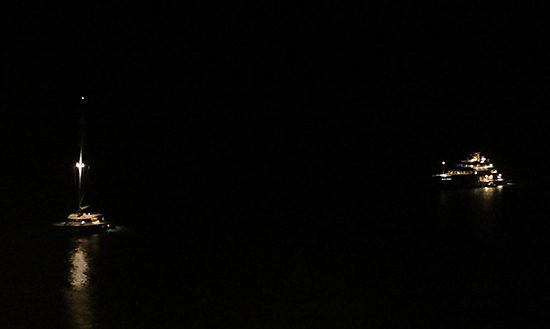 In total peace, we watched the lights of the yachts dancing across the dark sea below. To serene island sounds, we slept easy that night. Cool, in crisp sheets, waking up to this view, how could you ever want anything more? There's something about those special mornings, when the light is so soft, the early air almost a little brisk. My Dad and I couldn't get enough of it. 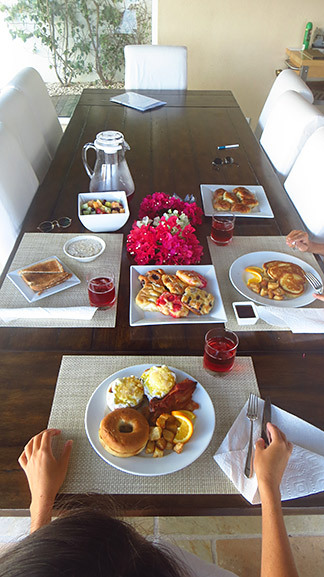 Soon after, breakfast was served. Place your order the night before if you would like to dine in-room. Otherwise, breakfast is at the Blue Bar downstairs. We threw open the windows and dug in. Toast, oatmeal, the continental breakfast included all of our favorites, including a variety of danishes and bagels. My Dad went for a hot breakfast of eggs benedict and home fries. For good measure, he asked for a "side" of buttermilk pancakes, too. Birds chirped in the distance. 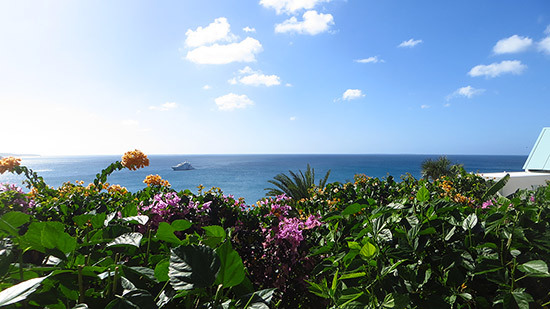 A soft, tropical breeze blew gently. This is how mornings should begin. 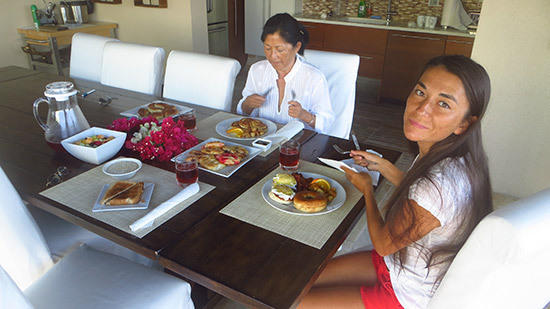 Kissed by warm rays from sun-up to sun-down, in a flawless setting that offers both endless views and beach access, with my Mom and Dad at my side and my sister on FaceTime, there are certain experiences that you know you will always remember. Our time at CéBlue was exactly that. For more on rates, availability and to book, click here.